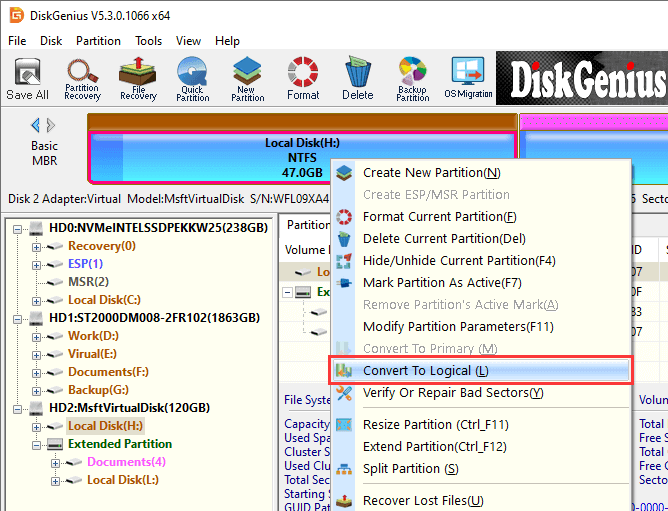 DiskGenius provides the function to convert primary partition to logical as well as convert logical partition to primary without data loss. One MBR disk may contain 4 primary partitions at most or 3 primary partitions with one extended partition, thus partition converting between primary and logical has some limitations. Step 1 Right-click the primary partition you want to convert and choose "Convert To Logical". Step 2 Click "Save All" button on the tool bar and a message box shows up. Click "Yes" to make the converting take effect. Note: Since logical partition is 63 sectors bigger than primary partition, there should be at least 63 free sectors in front of the primary partition when changing it to logical. Step 1 Right-click on the logical drive you want to convert and select "Convert To Primary" option from context menu. Step 2 Click "Save All" from tool bar and click "Yes" from the pop-up window.